Sydney Olympian Steven Solomon has set a new personal best breaking the magic 45s barrier for the 400m sending him into the hallowed Olympic final. In spite of encountering tactical problems at the final bend, Solomon found massive power in the charge for the line crossing in third position in a time that outpaced most of the runners in the three heats. When interviewed on TV after the event but before knowing he had qualified for the finals, Solomon thanked all those who had sent him wishes. This track star is a very modest, focused man who has attracted a massive following. 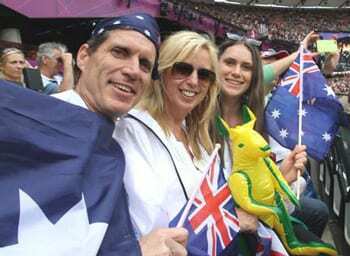 Cheering Solomon home in the Olympic stadium were his parents Michael and Lucille and sister Bianca. 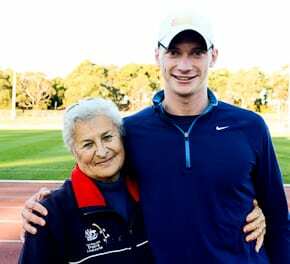 Also on his feet was Maccabi stalwart Harry Procel who will lead the Australian delegation to next year’s Maccabiah. The selectors’ faith in Steven has been fully justified. All the best for the final.